For any of you who have ever been to a hockey arena or a bar you have probably seen a Super Chexx Bubble Hockey Table! 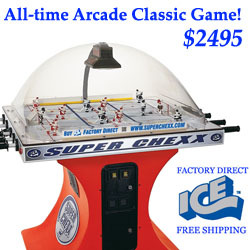 Super Chexx by ICE is the original Bubble Hockey Table, and is the best quality game on the market. The production of the top table top hockey game began in 1982 and still continues to this day! The Ice Super Chexx hockey game has a total of 10 players and 2 goalies just like the real game of hockey! Each player can turn 360 degrees and the goalies can move side to side. The key is the high dome of the game and the way the puck slides on the ice surface. The puck reacts in a very similar way that a puck acts on real ice. I remember as a little kid going to one of my hockey games only to find out it had been canceled, so since my whole hockey team was there and the arena had an old Super Chexx, probably one of the original models if I had to guess, we had a Bubble Hockey tournament! We all had a great time. Just a few weeks ago my family bought a Super Chexx bubble hockey game for our basement, in all honesty having a Super Chexx is great for many reasons. First off, having a Super Chexx in your house looks sick, what we did to our Super Chexx is we ordered custom Players and Ice! We custom made our players in the Buffalo Sabres and Boston Bruins uniforms (you can get players in any NHL Team, AHL team, or Country). For the ice we installed the NHL Logo ice, the upgraded package also came with NHL stickers to put on. Second, whenever we have company over they are always saying how cool it looks. It is great for when you have company over or you’re hosting a party because everyone will get into the game.